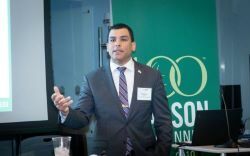 At the Boston Intercollegiate Veterans Networking Event at Babson College Secretary Francisco Urena spoke about the benefits of the VBOI in helping veterans to become business owners. The VBOI has graduated over 500 students and created over 20,000 job since its inception. Recently the VBOI started a Chapter in Worcester.